There is Nothing Hidden that Shall not Be Revealed! What a fantastic session with this client! I am so grateful to her for allowing me to share with you her transformation. 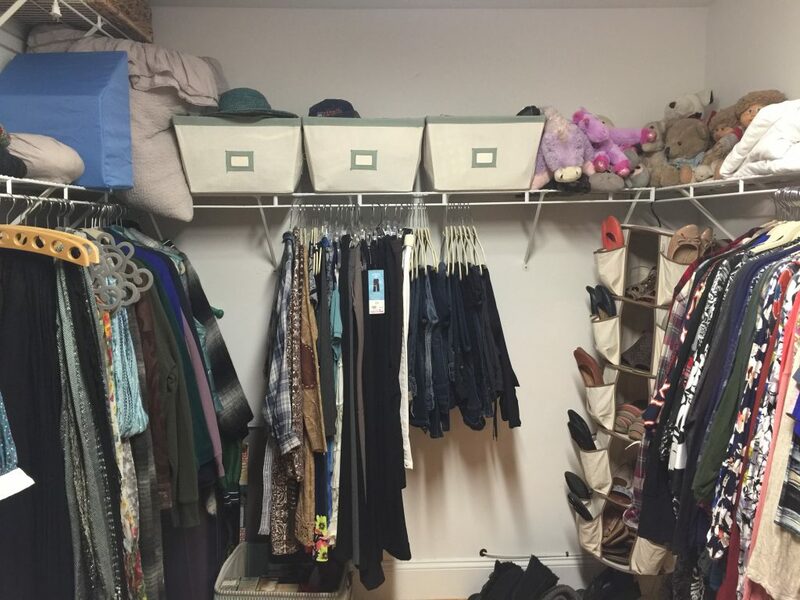 Her closet is 14.5′ x 8′, the size of a small room. 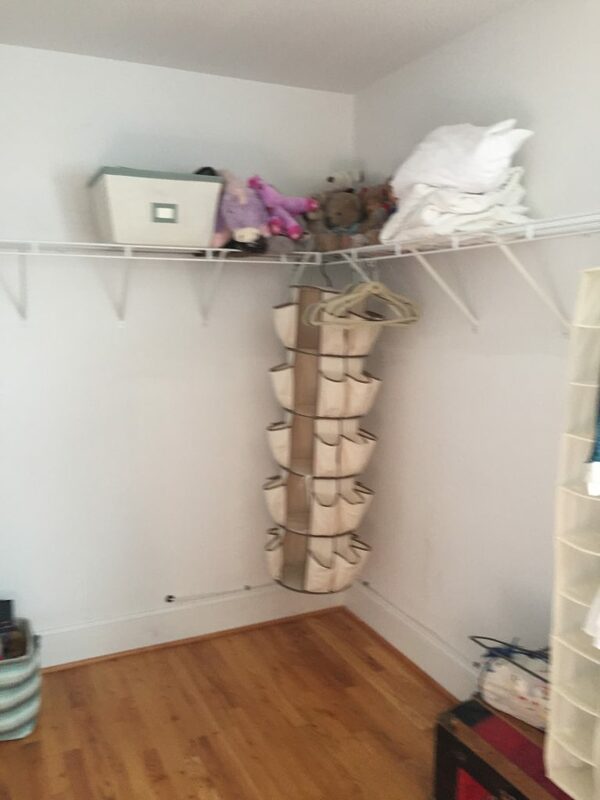 She had 25 feet of hanging space to work with and was able to store a small chest of drawers in her closet along with several shoe racks. 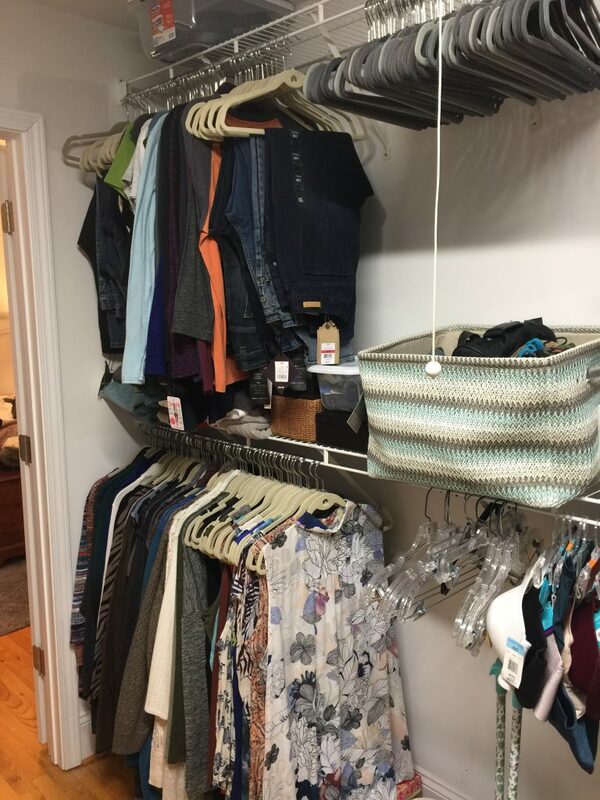 Her experience is a lovely example of how you too can get your closets and your life under control! We began by discussing what it is she wants and loves and what she dreams and imagines for her life. And that meant creating more space for real connections to take place. We agreed to start with her closets and work from there. 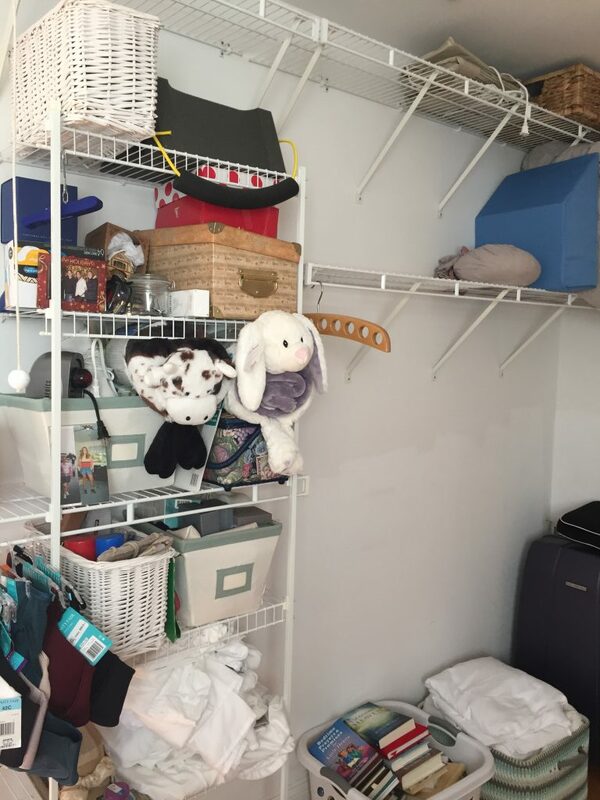 After creating her vision we then went to the mat emptying out all her closets, chests of drawers, and ancilary clothing racks – putting them all together in one place. The transformation was phenomenal! Take a peek into the process – Before, During and After! 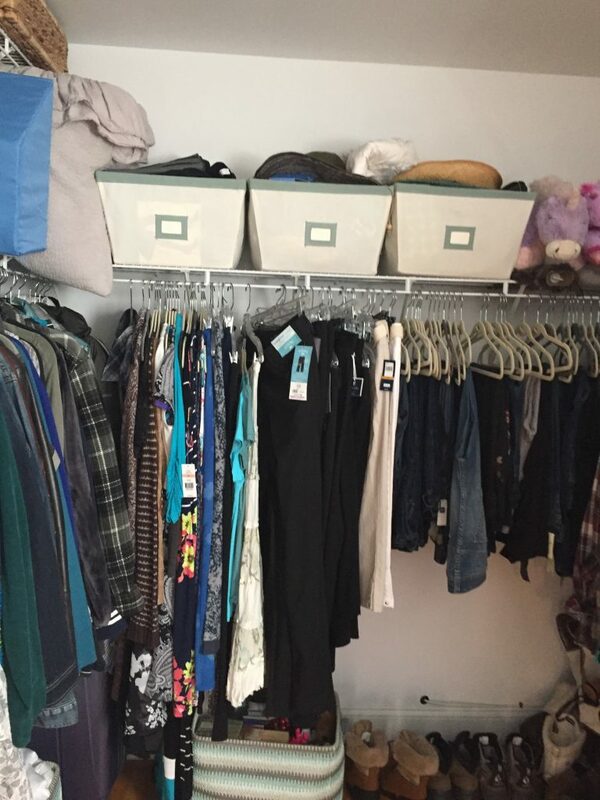 You can see what a wonderful sized closet this individual has and how she is managing space utilization – not unlike how I too used to utilize my closet space until I learned a few techniques. 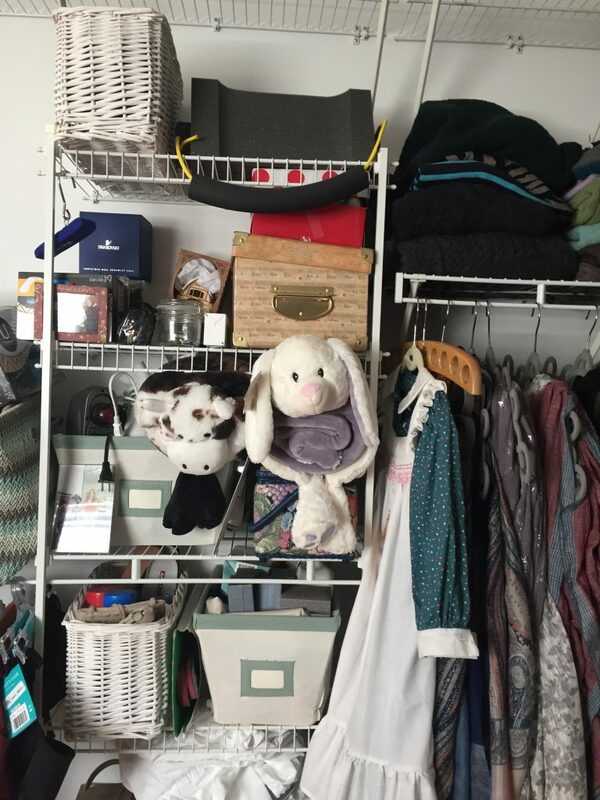 Clothes are organized by size and function without thought to organzing by color or hue; items are fitted into the hanging areas as best she can. You can see that many of the clothes hanging still have the original tags on and that they are in some areas crammed into the space. Some Things We Just Must Keep! We decided to wait on this section of shelf space as the primary focus needed to be her clothing and these shelves met her needs for now. Pants Tagged & Untagged ~ Accessories in Baskets Above! Pretend the picture above extends into the picture below. 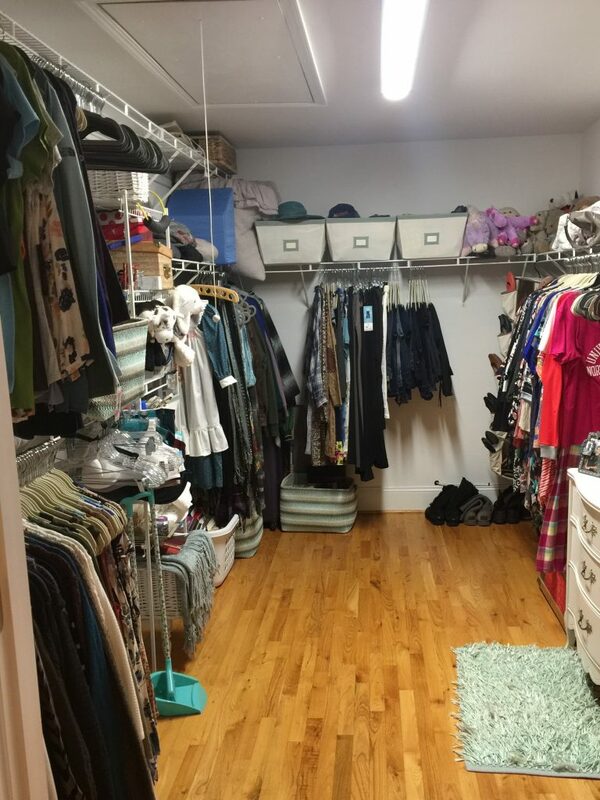 Allow your eye to follow across and view the right side of the closet in the next picture. What do you see? Something hidden shall be revealed! You can see how the hangers look a bit like “bird-wings” because there just isn’t enough room. 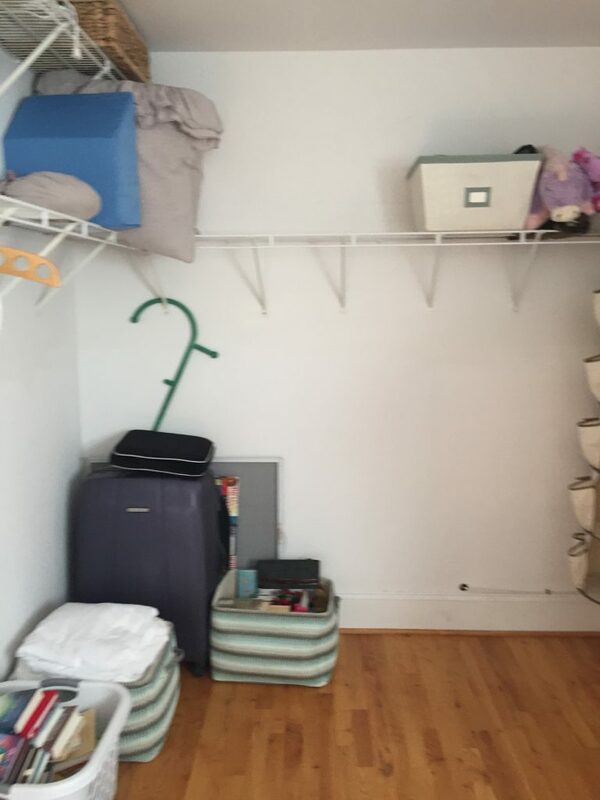 Also, hanging in the corner is hanging shoe storage…but it’s tough to get to without pushing clothes to the right. And here again, there are many items of clothing that have never been worn – still tagged. I love shoes too! So much fun to match with different outfits. 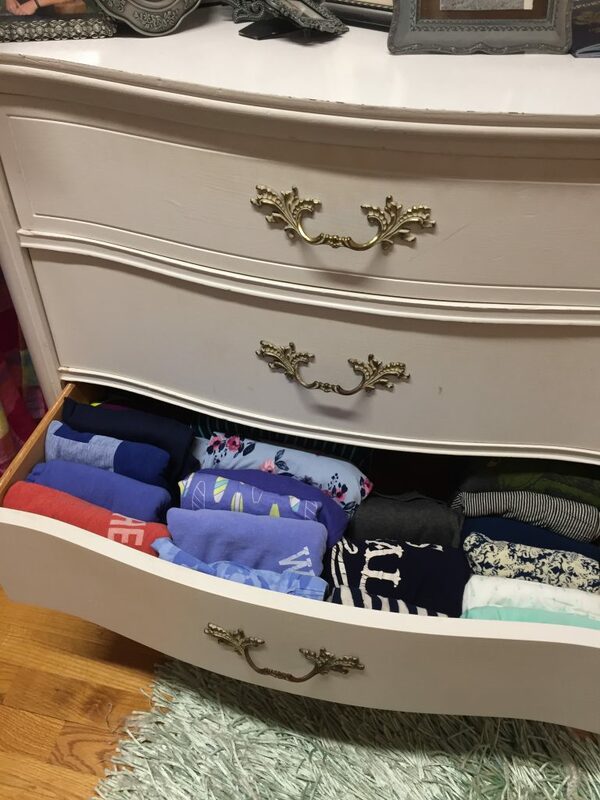 But, matching is difficult when it’s tough to see your clothes. 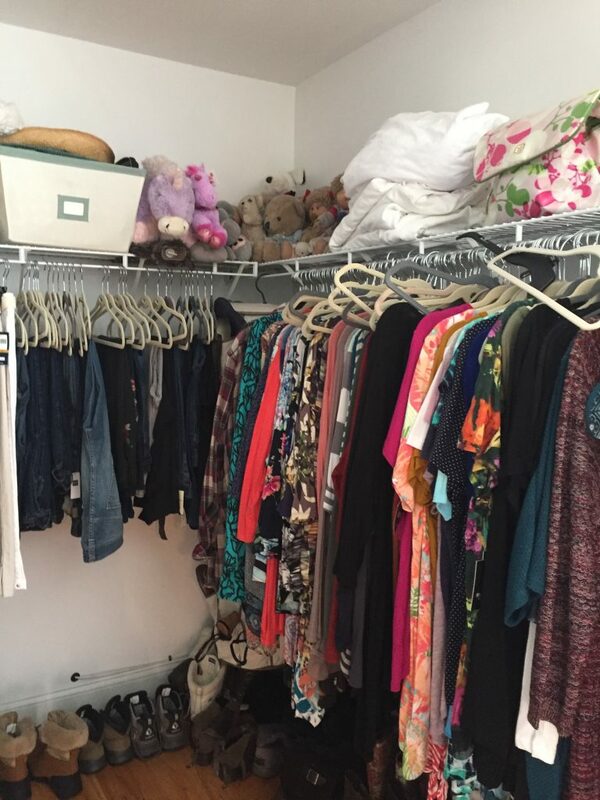 The next step was to empty out her closet – completely. This meant everything that was to be sorted would be removed. 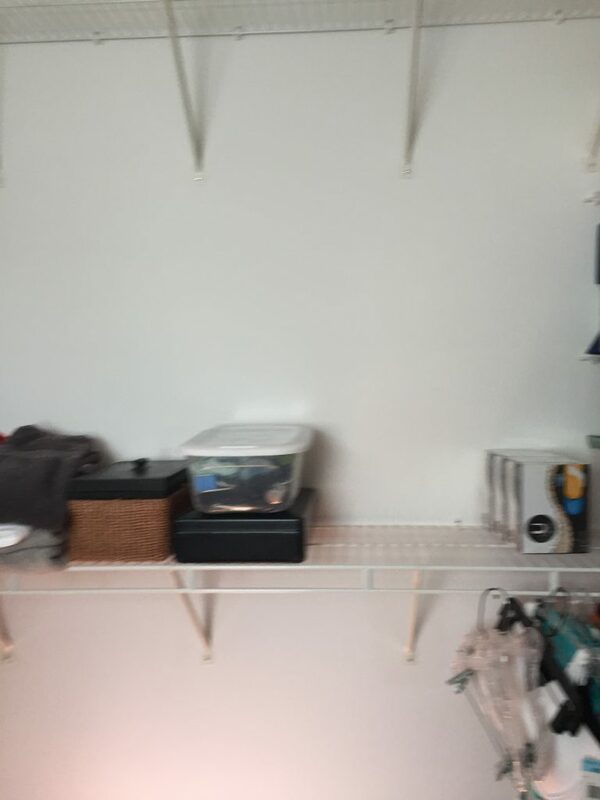 All pictures are moving from Left to the Back of the closet to the Right side of the closet. Back left side…Your view moves to the right side of the closet coming up toward the door. Now you see it clearly! Keep scrolling for the full effect….I have omitted a picture of this client’s chest of drawers between the photo above and the shoe rack below for privacy as family pictures are beautifully displayed. Nice lighting from the window above! Now it was time to begin. We placed everything on her bed or at the foot of her bed. 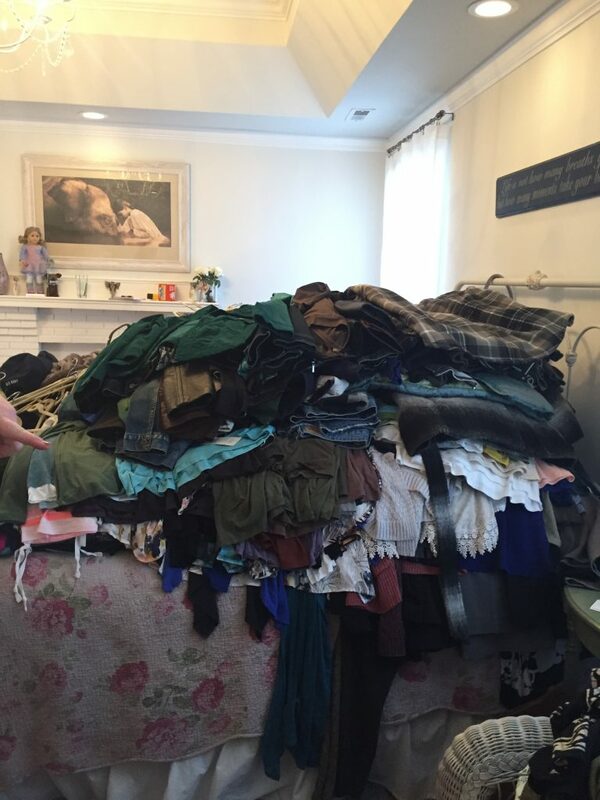 You will see how high her clothes were piled. After everything was ready, we began. During the interview process we had explored the kinds of textures, colors and shapes that made her happy. Not just happy, but filled with Joy! The “Wow” factor! As she handled each article of clothing, she used all her senses to connect with each item. Some connections were like lightening! She knew what she liked instantly. 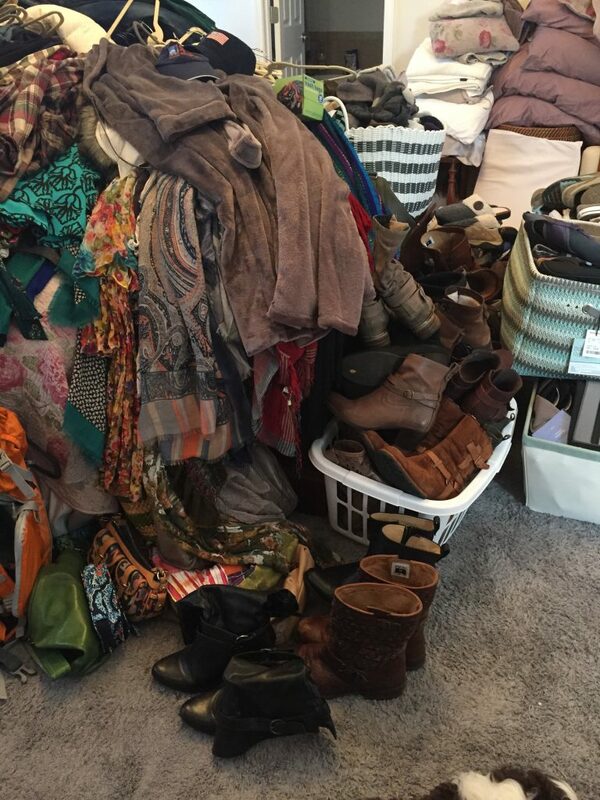 When the decision was made the item went into the keep pile, donate pile or consignment pile. We bagged items as we went along. 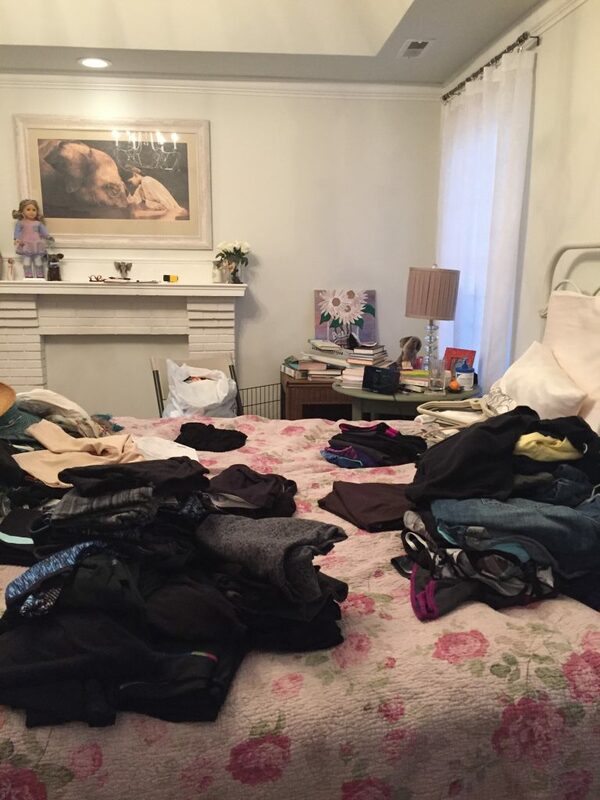 The more we worked together the more clear she became about what items of clothing were really in alignment with her essential self – that place within where we are most at home, where we feel most centered, and are most free. Notice where the “Mountain” meets the Fireplace! 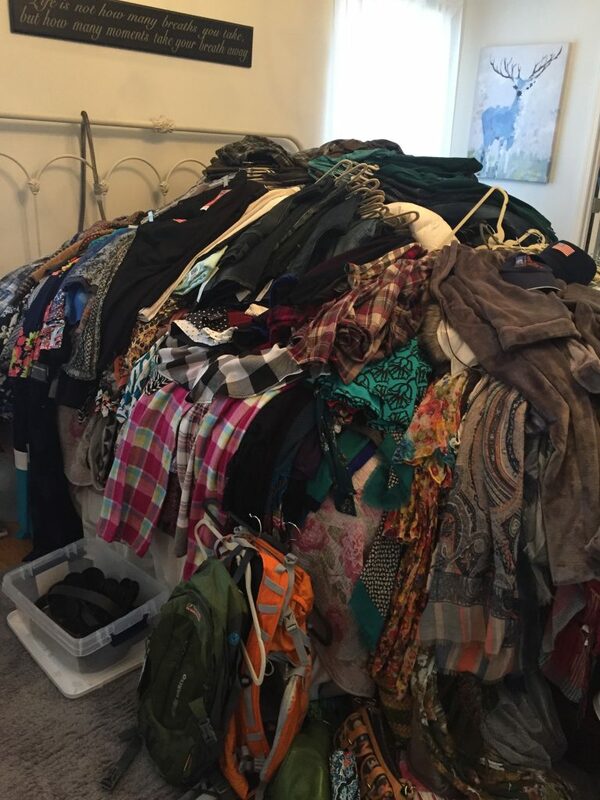 It took 6 hours of work together to “level” her “Clothing Mountain” but we did it one item at a time. There were still boots, shoes, purses and other accessories to go through. However by working together she re-discovered what she loves and was able to complete the rest of the sorting on her own. She now owns Only Things She Loves! Nothing Hidden that Shall not Be Revealed! 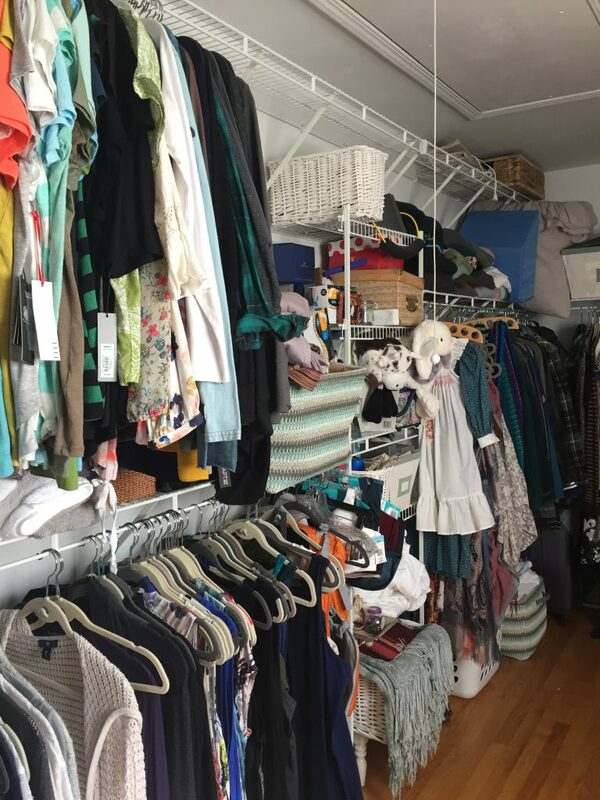 Before I started this work I had always heard that emptying out your closet and drawers completely before you begin to sort or weed out was key to successfully organizing your closet. It sounded like a heck of lot of work to me and so I didn’t do it. What I have learned as I have moved into this work is that doing it all in one fell swoop, disrupting how you usually see your clothes, is a really important part of the process. Many times I’ve heard, ‘do one room at a time’ or ‘do one drawer at a time’. The problem with that approach is you will be perpetually sorting and organzing – forever. You also cannot organize when you have too much in the size space you have. 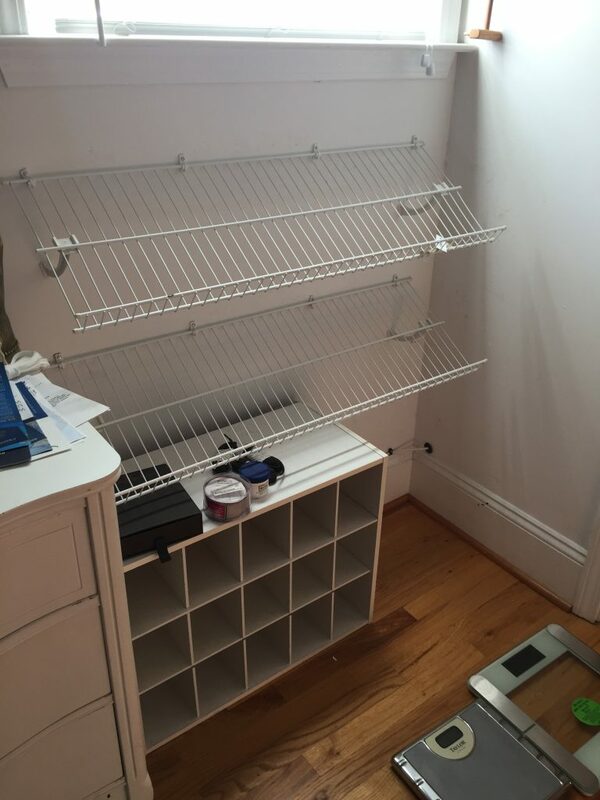 By removing everything at once it makes the sorting psychologically and physically easier. 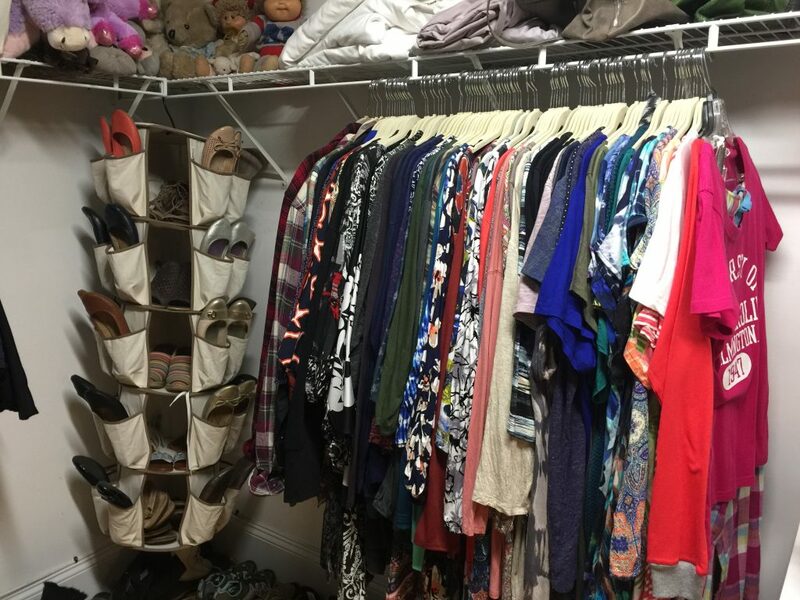 Clothes on the bed no longer ‘belong’ in your closet. And you don’t have to worry about moving clothes aside, walking back and forth to try something on and then re-hanging it. Once everything is on your bed or floor, you can stop worrying about making a mess. It’s all THERE! All you have to do is pick it up, commune with it, and get your final answer! This method allows you to really be present with your clothes and immersed in the process. And because you bag your clothing as you go, as part of the process, the mess gradually takes care of itself. 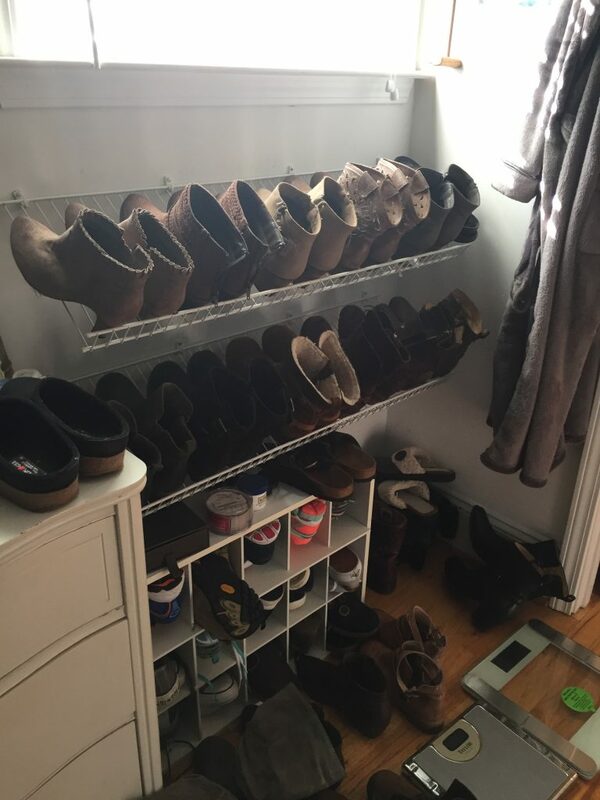 I hope you’ve gotten some good ideas about how you too can get control over your closet. Please let me know if you have any questions…be glad to help!